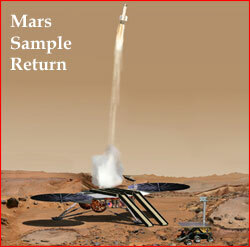 A Mars sample return mission (MSR) would be a spaceflight mission to collect rock and dust samples from Mars and to return them to Earth. Sample return would be a very powerful type of exploration, because analysis is freed from the time, budget, and space constraints of spacecraft sensors. All of Earth’s laboratories could potentially study a sample. According to Louis Friedman, Executive Director of The Planetary Society, a Mars sample return mission is often described by the planetary science community as one of the most important robotic space missions, due to its high expected scientific return on investment. Over time, several missions were planned but none of the proposed missions got beyond the planning phase. The three latest proposals for a MSR mission are a NASA-ESA proposal, a Russian proposal, Mars-Grunt, and a Chinese proposal. MSR was the highest priority Flagship Mission proposed for NASA by the Planetary Decadal Survey 2013-2022: The Future of Planetary Science.